James's Omniture can tell you how many people click on your Web site and how long they stay - data that's critical for any Fortune 500 company. Oh yeah - he just sold it for $1.8 billion. 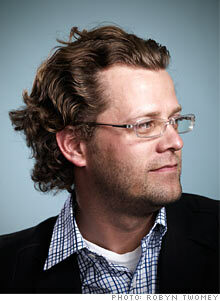 What happens to Josh James after the $1.8 bilion sale of Omniture to Adobe goes through? (Fortune Magazine) -- When it was finally time for Josh James to make the phone call, he stepped out of a meeting on the 37th floor of Midtown Manhattan's Marriott Marquis and paused for 10 minutes to revel in his private elation. Sweat beaded up behind his Gucci glasses as he thought back a dozen years to his company's early days, when he and his co-founder maxed out on student loans and hawked wedding gifts to buy computers. He remembered the time in 2000 when he agreed to a sale that fell through - and his trip to the Nasdaq Stock Exchange six years later to ring the bell when the company finally went public. He called his wife; he called his board chairman. He called briefly upon God. Then, before his iPhone would lose its charge, James, 36, called Adobe CEO Shantanu Narayen to tell him on behalf of the board that the deal was on. He'd sell his company, Omniture, to Narayen for $1.8 billion. Meet No. 26 on Fortune's 40 Under 40, a sandy-haired, gap-toothed entrepreneur who is at the center of one of the fastest-growing areas of business these days: measuring the web. Omniture (OMTR), the business James founded in 1996, sells subscription-based software that gives companies live, detailed digital traffic data. Unlike ratings firms like Nielsen and ComScore, which rely on human panels to estimate web habits, Omniture delivers its customers actual traffic data as it happens in real time, tracking everything from how many people visit a site to where they're coming from to how long they linger. It's almost as if a marketing rep were sitting next to every web user with a notepad observing him in his living room. That information is critical for any Fortune 500 chief marketing officer trying to figure out a web strategy. Newell Rubbermaid (NWL, Fortune 500) uses it to tell how long parents spend on its Gracobaby.com before going to a retailer to buy the Graco Nautilus car seat (7½ minutes); Northwest Airlines uses it to serve up specific discounts for, say, frequent fliers who are searching out business-class fares to Paris. Other competitors include Coremetrics and Google's (GOOG, Fortune 500) newly launched Google Analytics, but Omniture is the leader by far, with five times the customer base of Coremetrics, its closest rival. Its dominance of a field that Forrester Research expects to grow 17% annually has led it to more than triple revenues since 2006, hitting $296 million in 2008. Adobe (ADBE), facing a slowdown in its core business, wants some of that growth. The web tools company has long used Omniture to help measure the Flash software that powers so many of the graphics-intensive sites on the Internet. It now plans to bake Omniture's analytics into Flash itself, giving Flash users an easy way to track website performance. "The fact that Adobe paid nearly $2 billion says they see a bigger opportunity here," says John Lovett, an analyst with Forrester. It all makes Omniture sound every bit like the classic Silicon Valley startup, right down to its founder: James dropped out of college to start it, and when he took it public on his 33rd birthday in 2006, he was one of the youngest CEOs ever to do so. He counts as mentors Valley luminaries like Salesforce.com (CRM) founder Marc Benioff. Only Omniture didn't sprout up in Sunnyvale or Mountain View, Calif. but in Orem, Utah, and its path from startup to exit is anything but expected. Travel south out of Salt Lake City for close to an hour and you'll hit Provo and Orem, twin towns that sprawl in a grid-like formation away from the campus of Brigham Young University. Omniture operates from an office park here, but the buildings seem straight out of Sunnyvale, with exposed brick, open stairwells, and a cavernous game room. From the second-floor balcony, employees can climb across scaffolding into orb-like hanging seats for a round of Grand Theft Auto on a projection-size movie screen. But rent is the first reminder that this is no Silicon Valley: James locked in a deal on the office space (which was once the headquarters of another of Orem's contributions to technology, WordPerfect) at $13.50 a square foot per year, with the first year free -- a third the going rate in Sunnyvale. The culture is another reminder. A visitor to Omniture's headquarters, where half of the company's 1,200 employees work, might find the workforce fairly homogenous: it's predominantly white males. That's because, like their founder, three-quarters of Omniture's Orem-based employees are practicing Mormons; because women tend to stay home to raise large families, workers skew heavily male. Like James, many are BYU or University of Utah alums who want to stay in the area, giving James a tactical advantage when it comes to keeping his talented techies. For example, Monday evenings, James explains, are for family devotion in the Church of Jesus Christ of Latter Day Saints; employees generally leave by six. When he's in town, James, too, tries to spend the evening over dinner with his wife and five daughters, who range in age from 3 to 12. Yet at the same time, the tone at Omniture is very Valley: hard-core work ethic paired with clean-spirited pranksterism (think Judd Apatow without the cursing or booze). When James wanted to close a deal with IBM (IBM, Fortune 500), he wallpapered the sales rep's office in IBM blue and decorated it with old IBM paraphernalia he found on eBay (the rep closed the deal). And when the general counsel complained he had to spend too much time at work, James had his assistant install a Porta-Potti in the guy's office with a note that read, "Now you never have to leave." He wasn't really kidding. His chutzpah can at times prove trying to some of his senior executives. Two months before the company's IPO road show, James, who does not drink alcohol or coffee, attempted to outdo drunken partiers at a customer retreat. Using a hanging piece of art as a climbing wall, he shinnied up to a balcony railing, but when he couldn't hoist himself to safety, he jumped 20 feet and broke his leg, his fibula jutting out of the skin by his ankle. James showed no fear. "I knew I wouldn't die," he says. "People break legs." James has never lacked the courage of his convictions. The oldest of six children in a military family, at 19 he spent two years in Japan as a missionary. He was so enthralled by a course on entrepreneurship during his final semester at BYU that he persuaded classmate John Pestana to drop out of school with him a month before graduation in 1996 to start the Internet company that would eventually become Omniture. In fact, James came very close to cashing out once before. In the fall of 2000 the company he and Pestana founded, then called MyComputer.com, had gained traction; software company NetObjects offered them a stock and cash deal. The Salt Lake Tribune published an article titled "How two BYU dropouts made their first $57 million," and the governor of Utah traveled to Orem to pose for a photo. Then, before the deal could close, NetObjects went bankrupt. As the holidays approached, it became clear not only that the founders would be out their bonanza but also that the two had no resources to pay their employees. James, Pestana (who retired after the company went public), and their CTO hunkered down for several nights searching for a way to save the business. Two weeks before Christmas, James herded three-quarters of his employees together and told them they were laid off and would receive no severance. "It was awful," he says. Chastened by the near-death experience, James refocused. Until that point, MyComputer.com had made its business helping individuals measure traffic to their websites. Then a new customer, eBay (EBAY, Fortune 500), called to encourage him, and he realized there was a much bigger opportunity in the corporate market. "I was like, 'I must not be charging enough money,'" he says. He went on the road to sell the product himself. Within a year things picked up, and Omniture - a name James chose because it sounded big and techy and it got zero hits when typed into Google - began to dominate web analytics. In 2005, after the company had gotten new funding from investors including Hummer Winblad Venture Partners, and shortly before Omniture prepared to go public, James looked up all 82 of the employees he'd fired five years before and issued them checks for two weeks' pay. "You get this little knee-jerk reaction of, 'Oh, what's this going to do to our cash?'" says Fraser Bullock, an early investor who now chairs Omniture's board. "But then you immediately switch to 'Wow! That's really impressive. That is the right thing to do.'" One week after James agreed to become an Adobe employee, he sat down for lunch at the fifth-floor caf in New York's Museum of Modern Art. He was feeling pretty good. He'd landed a 45% premium for his investors. And he felt confident that Adobe, which successfully integrated another midsize company when it bought Macromedia in 2005, would be a great place for his employees. All that is far from certain. For every Macromedia, there's a Skype, eBay's botched attempt to extend in another direction with the Internet video phone service. Indeed, many tech analysts questioned the Adobe deal. Adobe, after all, is in the business of making web developers' tools, not marketing products. And a month after the deal was announced, an article in the Wall Street Journal pointed out that top Omniture executives, including James, exchanged old options for new, lower-priced ones after talks began with Adobe. James says that the options exchanges were a common talent retention tool, that he was always talking to potential partners, and that the talks with Adobe didn't get serious for another month. Perhaps the biggest question, though, is what happens to James after the sale is complete. Will the founder who installs Porta-Potties for fun be able to fit in as a senior vice president at Adobe? Will he want to? He's been asked more than once to run for public office in Utah. He's said no so far, but he admits he might be interested in politics someday. Josh James has bigger walls to scale yet.